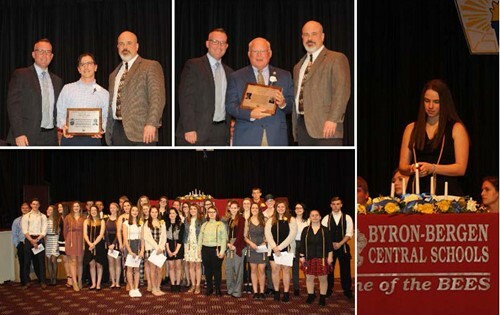 It was an evening of accolated at the Byron-Bergen High School. Kenneth Hay (Class of 1966) and Dennis DeVelder (Class of 2001) joined the ranks of other distinguished Byron-Bergen alumni honored with a place in the Alumni Hall of Fame for their achievements after graduation. Additionally, the National Honor Society welcomed new members. Congratulations to everyone.